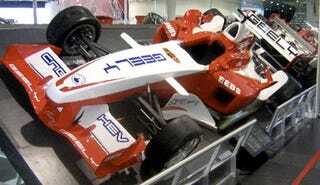 When we first showed you a rendering of the Geely formula car, details were unavailable on what exactly it would be. We scoffed and expected nothing more than a semi-functional fiberglass F1-wannabe. But it turns out Geely actually turned up to the Beijing Motor Show with a relatively impressive machine. While it's not going to be racing in Formula One, it will be raced in Formula Geely, an Asia-only spec-series. How close is it to F1 specifications? Geely To Make Chinese Rip-Off Of Ferrari F1 Car? Well, the car is allegedly made of carbon-fiber. Though we're not too sure how much time (if any) has been spent refining the aerodynamics in a wind tunnel. Power comes from a 3.5-liter engine, which is pretty impressive, considering that F1 cars only have 2.4-liters. Thing is, while the 2.4 in Ferrari or McLaren racer is a V8 estimated as making around 800 HP, the Geely's 3.5 is a V6 that we estimate as making around 80 HP— ok, maybe a little more than that. We're not saying we'd turn down a chance to take it around a track and play with its 6-speed semi-automatic gearbox, but until it gets a fancy nose piercing like Ferrari's race car, we're not so excited by the GF.